Kerbal Space Program (KSP) is a critically acclaimed, bestselling space flight simulator game. It’s making waves everywhere from main-stream media to the actual space flight industry, but it has a bit of a learning curve. 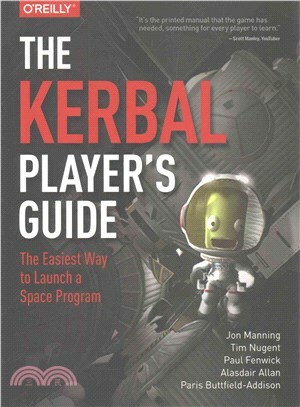 In this book, five KSP nerds—including an astrophysicist—teach you everything you need to know to get a nation of tiny green people into space. KSP is incredibly realistic. When running your space program, you’ll have to consider delta-V budgets, orbital mechanics, Hohmann transfers, and more. This book is perfect for video game players, simulation game players, Minecrafters, and amateur astronomers. Jon Manning is a world renown iOS development trainer and writer, game designer and mobile software engineering wizard. He has co-authored two books on mobile development and enjoys re-implementing such things as OpenGL and the Objective-C runtime (in his spare time). Jon is also a researcher in Human-Computer Interaction working towards a PhD. Alasdair Allan is a scientist, author, hacker, tinkerer and co-founder of a startup working on fixing the Internet of Things. Paris Buttfield-Addison is a mobile app engineer, game designer, and researcher with a passion for making technology simpler and as engaging as possible. Paris recently submitted a PhD investigating how people use tablets for information management. Paul Fenwick is an internationally acclaimed public speaker, developer, and science educator.